O limite de entrega dos trabalhos será dia 5 de Setembro de 2019, e até dia 10 será feita e comunicada a selecção dos trabalhos, com o objectivo de ter o livro pronto em outubro. Como de costume contamos fazer também uma campanha de crowdfunding para financiar a produção do livro. Serão aceites trabalhos a preto e branco/escala de cinza e a cores. O formato de página será o do costume: 270 mm altura x 190 mm de largura. O modelo da página pode ser descarregado AQUI! Como de costume pedimos aos autores que desejam participar que nos informem da vossa intenção preferencialmente antes do envio do trabalho final, o mais cedo possível, de modo a que possamos fazer um acompanhamento do trabalho. Se tiverem um argumento e procurarem desenhador, ou vice-versa, digam-nos pois poderemos divulgar/facilitar a procura. Se tiverem dúvidas sobre alguma questão não hesitem em contactar-nos e consultem o guia sobre como PARTICIPAR NA ZONA! 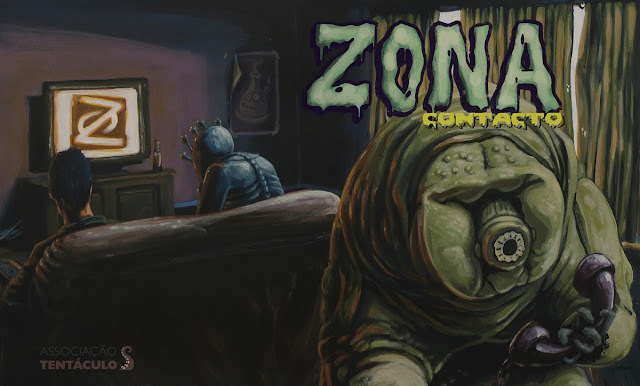 New Zona issue, call for submissions! Zona magazine is turning 10 years old in 2019 and is launching a new issue with the milestone in mind! With a new editorial/coordination team this time composed by Fil, Filipe Duarte and Miguel. This time, the subject is “10 years”, which can be followed in a very open way. If you are interested in collaborating in this new edition, feel free to contact us. The deadline for the submission of your work is the 5th of September 2019, and we will have the selection done and communicated by the 10th of September. We plan to have the book ready by October 2019. We will also launch a crowd-funding campaign. The submissions could be both in black and white / gray-scale and color. The page size is the usual: 270 mm high x 190 mm wide. The page template can be downloaded HERE! As usual we ask authors to inform us as soon as possible, before sending the final work, so we can better prepare the publication. If you have a story and would like to find someone to illustrate it, or the other way around, we can help you find someone for you, so let us know.